Instagram has become an unsuspecting pulpit ­– seemingly caught off guard – for those determined to spread a militant message of Islamic State terror. Graphic, fanatical and oftentimes heavily photoshopped images weave through Instagram’s labyrinth of sunset snaps and gym selfies to advance a curious manifestation of cause-related self-promotion. An image of a cappuccino, trivial enough to be skimmed over by smartphone users scrolling through their feed; the same old content posted as visual shorthand for living the Good Life. But this isn’t a shot taken by an online friend showing off the skills of their favorite barista. 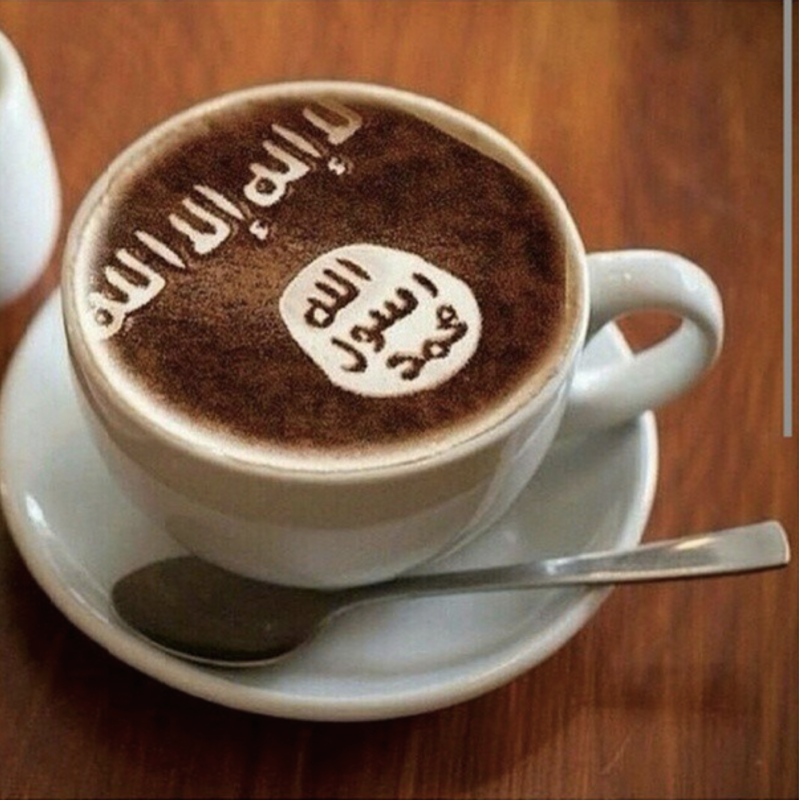 This coffee has been digitally manipulated to show the flag of Tawheed, commonly associated with the Islamic State, floating on its surface. Looking closer still, there is a grey strip a few pixels wide coming down the right side of the image. This along with the low resolution of the image in general indicates this is a screenshot: an image taken from somewhere else, given a square aspect ratio and repurposed for a new environment: Instagram. Where did this image come from? What is its purpose? For below Instagram’s frivolous, apolitical public perception bubble at times unexpected pockets of extremism. Over the past few years, and especially since its 2012 acquisition by Facebook, the average social media user has likely become intimately familiar with Instagram. It has emerged as the first port of call for the those still fascinated by the froth in their coffee, not to mention their own reflection. Avocado-infused smoothies and beach feet galore, the ever popular photo-sharing app has taken over from Twitter and Facebook as the paradigm of banality. 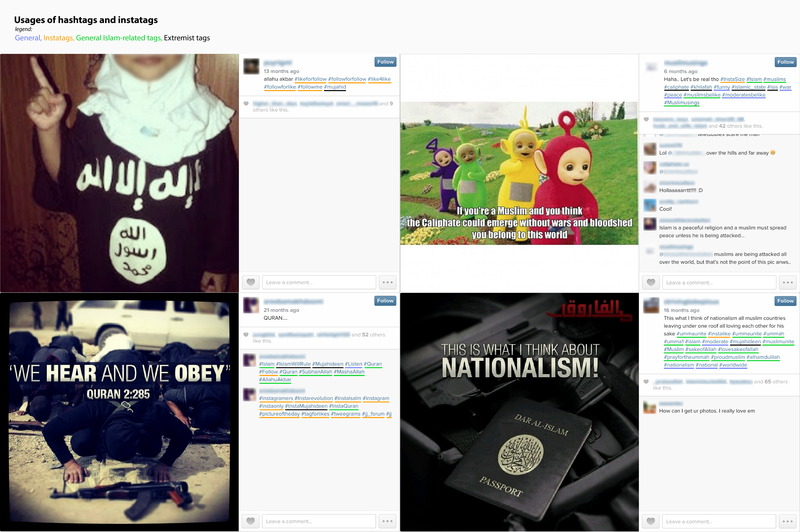 Supporters of the Islamic State have adopted Instagram as a colorful, online underpinning for support of the caliphate. Rather than purporting an explicit agenda of mass radicalization or rampant terror, these extremist Instagrammers are akin to fitness fanatics and their gym selfies, or to hipster gastronomes and the softened hues of their ‘filtered’ food. They are people with an obsession, and Instagram is their ready outlet. What we are left with are visual stimuli steeped in an ancient and barbaric cultural history, whose young owners possess an unpracticed, 21st century grasp of Instagram etiquette. While Europe is struggling to find a unified and humane approach to the many displaced Syrian and Iraqi refugees knocking at its doors, some people are still traveling the other way. The fact that foreign fighters are recruited not only from the Middle East, but also from Western countries has been well-covered in major news outlets. And although many articles have been written about the way the crypts of social media offer a safe haven for extremist thought, exactly what plays out there often remains rather vague. Using data gathered in the first months of 2015, before stories of sunken boats took over front pages, this article shines a light on those dark corners of, in this case, Instagram. While coverage by mainstream press fluctuates, examining data such as these illuminates the insidious and sustained flow of pro-IS propaganda on social media. We can still recall when Twitter and Facebook were primarily concerned with the mundanity of individual users’ lives, with Facebook strongly suggesting that users post statuses in the third person present tense until 2007, fixedly phrased as “John is…”, and Twitter asking, ‘What are you doing?’ circa 2009. While large swathes of both Twitter and Facebook users are no doubt still concerned with inconsequential comments on personal lives, Richard Rogers noted in his 2014 article Debanalizing Twitter that these platforms had more recently come to be known for the sharing of news, catalyzing political engagement, and for the promotion of activist movements. Savvy social media usage, both on the part of IS activists and enthusiastic news sharers on Twitter and Facebook, has played a significant role in amplifying the impact of IS in the media, carrying the conversation to all corners of the world. Few people will have escaped reports of the high profile, savage acts committed by IS or the social media recruitment techniques of IS sympathizers. Rather than being politically charged in and of themselves, Twitter and Facebook provide a stimulating environment, an infrastructure where users can share information from outside sources. On the one hand, Twitter feeds have become lists of links to click through, providing insight into what is happening in the world at large. On the other hand, Facebook groups and pages essentially become a pool of resources and shared opinions bringing together like-minded individuals. Instagram, conversely, does not allow users to engage with outside content in the same way. Users of the smartphone app find themselves trapped in a sunset-lined labyrinth, without easy exit paths to external links allowed by Twitter and Facebook. Aside from a single allotted space for a personal website in each user’s profile, Instagram does not support the sharing of links. If someone were to include an outside link under an image or video, it would not be clickable. Besides disallowing click-through links, no text on Instagram can be copied and pasted. Thus the platform capabilities of Instagram discourage users from treating the platform as a portal for sharing information from external sources. What does this mean for politically engaged or even extremist Instagram users? Surely when users shift their focus between different social media outlets, their sociopolitical beliefs do not get left behind? Following our previous investigative research into the sociopolitical actions of IS on Facebook, we became curious to understand the reality of IS on Instagram. By spending time trawling through individual profiles, as well as searching for IS-related keywords, we constructed a list of ‘gatekeeper’ hashtags that we believed would lead to the core of IS support on Instagram. We researched images and videos posted on the platform between January 20, 2013 and March 25, 2015. Having gathered 29,318 posts, we then reduced these to those displaying explicit, unquestionable support for IS. This amounted to 450 images and videos posted by fanatics from all over the world, brought together on Instagram. All claims we make within this article relate to this subset of IS content on Instagram. Before we begin discussion of these images we must acknowledge, as the numbers quoted above attest, that this research is not a comprehensive analysis of IS support on Instagram. 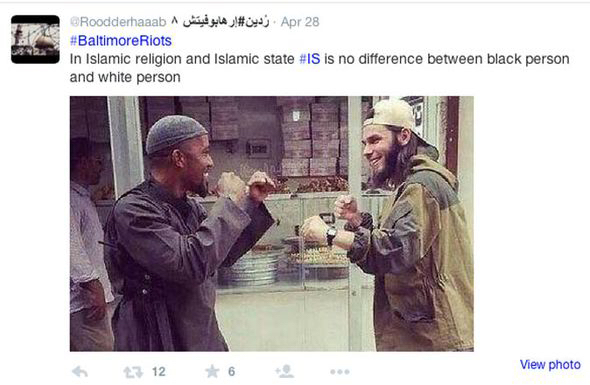 Rather, it is a glimpse into the mindset of people who choose to express their support for IS via Instagram. It is also important to consider that this pro-IS support on Instagram is the latest manifestation of a long series of jihadist propaganda. To understand the significance of the images gathered from Instagram, we must first briefly delve into this history. Rooted in a cruel, remorseless and sectarian approach to jihad, IS is calculating and opportunistic. It is also a product of its time. The self-proclaimed Islamic caliphate has prospered in the political and societal fissures following the 2003 US invasion of Iraq, and the Syrian Civil War of recent years. In what to most people seems like a fraction of a second, the Sunni militants have evolved from a splinter group affiliated with Al-Qaeda, into the world’s most feared terrorist organisation. IS is supported by on-the-ground militaristic success, funding streams that have made it the richest group of insurgents in the world, and a strictly reactionist ideology that evokes memories of a medieval, Islamic golden age. The roots of IS firmly took hold in 2004 when Al-Qaeda in Iraq (AQI) was founded, a decade before its declaration of the Islamic caliphate in 2014. AQI functioned as a loose affiliate of Al-Qaeda with distinct characteristics of its own. Al-Qaeda’s propaganda at the time portrayed the organization as a defender of the Islamic community against negative Western influence and power. In contrast, AQI spoke a language of confidence and strength in battle. Militaristic prowess and the glorification of death in combat dominated the propaganda released by AQI, and also that released by its heir, IS. This is most apparent in the organization’s four-part series The Clanging of the Swords, released in 2012, which marked a shift towards propaganda of professional quality. It featured well-directed camerawork — including aerial drone footage — and a strategic narrative that melded displays of martial strength and violent imagery with shows of compassion and forgiveness. Videos and images produced by IS depict violence and execution through various means including decapitation, death by falling, and being set alight. The use of this kind of savage imagery has its origins in the jihadist text The Management of Savagery which advocates using physical violence as well as the dissemination of brutal imagery for successful jihad. Social media have provided IS with the tools to crowdsource both the creation and distribution of its warmongering ideology. Using the echo chamber of retweets and likes, IS succeeds in spreading its tendrils beyond its territorial victories. Akin to a media organization, propaganda released by IS has tapped into what makes a content-hungry audience tick. This has set it apart from the jihadist tradition of long, tedious speeches unsuited to the Western attention span. IS as we have come to know it in the past two years is what happens when jihadists understand how to get their message spread online by a frenzied audience. Technology has long been used for the distribution of extremist content via cassettes, internet forums, video-sharing platforms, and so forth. IS now has a learned understanding of technology that appeals to the scrolling generation. Short attention spans are captured by slick editing, high quality cinematography and the kind of storyboarding that are more commonly associated with first-person shooter games and war movies. The beheading video featuring Jihadi John presented IS as a strategic army performing with almost choreographed precision in the media. The fitted, black drapery of the British executioner, the baggy orange jumpsuits of his victims, and the professional video production portrayed a barbaric yet articulate force familiar with social media and marketing know-how. Social media platforms are designed to build global communities, allowing everyone — violent extremists included — to connect across the physical barriers that may exist. The networks of sympathizers on Instagram are crucial to IS because they are not limited by geographical boundaries, but are instead linked to each other as a tight online community. Instagrammers have the opportunity to geotag their posts, but this is far from common practice. With only 10 per cent of the posts we aggregated being geotagged or having additional locational information, it is quite difficult to determine where posts come from. Nevertheless, our small sample of locatable posts shows heightened degrees of interaction in Sydney and Melbourne, a prolific user in Seattle, and another in Hamburg, Germany: a network of IS sympathizers spanning the globe. None of our geolocated posts originated from Syria or Iraq. It is possible that none of the posts we collected originated from the region; however, it is also likely that frontline fighters — being aware of surveillance practices — are exceptionally careful not to publish their whereabouts online. Individual cases like that of New Zealander jihadi Mark Taylor, who inadvertently revealed his exact location by forgetting to turn off geotagging on his tweets after arriving in Syria, are the exception rather than the rule. These maps are anecdotal snapshots rather than wide scale, structural patterns of the distribution of support for IS. Left: the number of geolocatable posts in each country; the darker the shade, the more posts. Right: the amount of aggregated number of likes and comments that geolocatable posts received; the darker the shade, the more interaction. The power of the online jihad of IS is supported by the amount of international ties that would have been near impossible offline. Instagrammers from around the world follow each other as well as comment on and like each other’s images, thereby creating an online community or network of decentralized but connected people. The differences in physical location from which posts originate mean that IS sympathizers are dispersed beyond Iraq and Syria. This decentralized network on Instagram features cases of individual agency and even creativity by users that contrasts IS’ repressive sharia state. What we see on the app is a synthesis of user-generated content and the representation of extremist ideology in digital visual culture. Many images are produced and distributed every month, reaching varying degrees of popularity, each one eventually becoming just one more forgotten photograph in the digital pile. The question is, however, what does it take for an IS-related picture to be popular on Instagram during its very short prime of life? Inching through our set of images, we were instantly surprised to find that, unlike they do on Facebook or Twitter, supporters of IS do not seem to react to major news stories using Instagram. Atrocities like the beheadings of James Foley, Steven Sotloff and David Cawthorne Haines, the burning alive of Jordanian pilot Muath al-Kasasbeh, or the declaration of the Islamic caliphate, which consumed mainstream media, created few waves on Instagram. Unlike other social media users, Instagrammers seem unconcerned with the 24-hour news cycle, while still engaging with a socially, politically and religiously charged agenda. They allow their own brand of extremism to flourish, highly concerned with their ideological goals but untainted by the rhetoric of Western journalism. There are two roles that anyone on Instagram, including IS sympathizers, is likely to adopt: supplier of content (by taking photos and sharing them), and/or consumer of content (by viewing, liking and otherwise interacting with images or videos shared by others). Selfies can be called popular because so many people post pictures of themselves, but an image posted by selfie-monetizer Kim Kardashian will quickly gain thousands of likes and therefore could be said to be more popular than the average selfie. As the quickest way of interacting with images on Instagram, liking is a quantifiable measure of what stirs people to take action on the app. It is a uniform and quantifiable way of showing approval for content, be it a mundane image of someone’s lunch or a more sinister image of crimes committed by IS. The like is Instagram’s currency and, consequently, a signifier of value on the app. The more likes an image receives, the more valuable it is. What happens when content is deemed valuable? It gains visibility in two ways: 1) it is increasingly circulated itself, 2) its subject matter, its use of inspirational or humorous content as well as its aesthetic qualities are being copied. Copying a valuable image’s theme, filter or humorous intent is a way for other users’ content to gain likes. What we end up with is a stream of images and videos that might be subtly different but which are – somewhat eerily – similar. What do IS activists share on Instagram? 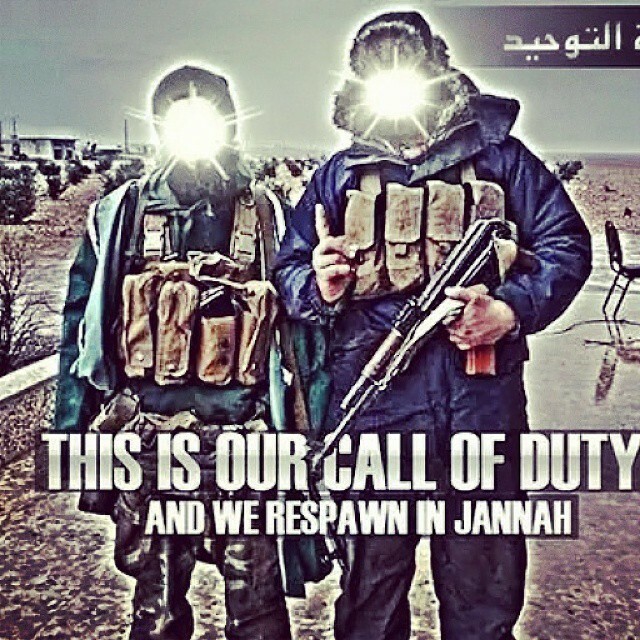 It isn’t surprising that the graphic portrayal of military jihad is prevalent amongst IS-themed posts on Instagram; this is a continuation of previously existing forms of propaganda that have been used by the various historical incarnations of IS. On Instagram, images of fallen fighters — taken both when dead and still alive — glorify martyrdom for the caliphate. Dead mujahideen are immortalised through metaphorical references, both textual and visual, to angels in heaven and birds in paradise. Appearing alongside images of military jihad are poses that come back again and again, like selfies, duck faces, and beach feet do in other online circles. Contrasting the overall light-heartedness of these pictures, IS’ brand of pose consists of standing in front of their pervasive black and white flag, rigidly upright, feet shoulder width apart, and one index finger pointing up towards the sky. In those images that originate from the frontlines in Iraq and Syria, one hand also keeps a firm hold of the barrel of a gun. The flag is a deliberately selected symbol of the links between the Islamic State believes to have with the Prophet Muhammad. The single, raised finger has developed into a visual identifier for the militant organisation akin to those used by city gangs: a non-verbal symbol to be recognized by those in the know. The pose represents tawheed or the belief in the oneness of God. As seen on Instagram, IS fighters and activists also use it as a sign of support for the global expansion of the caliphate. As with other more innocuous sides of Instagram, with IS content there comes a sense of monotony. Flags, shielded faces and guns, men posing the same way again and again. While the number of these images posted does speak for their popularity with the posters themselves, what leads others to like, comment and otherwise engage with content posted by IS supporters? Images of young children with the one finger salute, holding guns in front of the IS flag, seem to be a sure way of attracting likes from other IS supporters. The children in these images speak to the future, with the next generation lined up to fight for the cause. When it comes to popular content, there is also a large collection of miscellaneous posts that attract likes and demand attention. People use a variety of creative techniques to promote individual messages in aesthetically similar ways. There are inspirational quotes from the Qu’ran superimposed onto photographs alongside tableaus of weaponry, horses and flags reminiscent of a medieval era of Islamic dominance, and varying portrayals of IS’ black and white symbol. IS sympathizers on Instagram also seem to have a fascination with cats, a revered animal in Islam said to have been quite favored by the Prophet Muhammad. Frontline images of IS fighters cuddling kittens show a more caring and compassionate side of the militants, whereas the use of lions show quite the opposite. The lion metaphor represents the soldiers as ferocious warriors fighting an epic and heroic battle. Poster-like imagery hints at users who are proficient in the use of editing tools both in and out of the app. The outcome is an array of images mimicking first-person shooter games or movie posters, removing from people’s imaginations the real world consequences of IS as a physical entity on a terror rampage. In particular, typefaces that are associated with media productions such as first person shooter Call of Duty, the epic fantasy The Lord of the Rings, and the HBO series Band of Brothers are used to entice the viewer to join the adventure. Instagram endows a uniformity to content that easily enables pseudo-branding to be applied to IS ideology and graphic content. The aesthetic conformity of Instagram seamlessly applies to jarringly different subject matter. Extremist content sits amongst Instagram’s more innocuous images, captured in the same 640px by 640px square (at the time of data collection, this aspect ratio was still enforced), largely using the same set of editing tools and filters. These factors produce images that are uncannily similar in terms of tonality, degrees of contrast and saturation, and uniform overlays that can beautify the most pointless content as well as the most distressing. By means of Instagram, users are able to present IS and its ideology in unique and yet uniform ways. IS’ message flows into already existing streams of content on social media that would not necessarily be associated with violent jihad. In June 2014, around the time the caliphate was declared, the soccer World Cup twitter conversation was infiltrated by extremist messages tagged with the World Cup hashtags #WC2014 or #Brazil2014. Later in the same summer, YouTube teen-star Ricky Dillon’s #AskRicky campaign was incorporated in IS’ threat to assassinate American journalist Steven Sotloff, taking advantage of Dillon’s young audience for the purpose of gaining new recruits. In spring 2015, IS hijacked #BaltimoreRiots on Twitter to claim that in the Islamic State ‘black lives matter’ as much as any other life. The use of hashtags on Instagram differs. For Twitter, the hashtag carries a discussion; on Instagram the hashtag is assigned to an image, and indexes content. While many use hashtags to ensure that their image of a #beach is with all the other #beaches, hashtags are also used to add value to images within Instagram. For example, a subset of hashtags, including #instagood and #instalike, are used to garner likes and followers, rather than relating to the image content itself. When IS sympathizers use hashtags such as #instagood, they are doing it for the same, mundane reason as the person uploading a picture of their breakfast; that is, to get likes and followers. However, IS’ use of ‘instatags’ such as #follow4follow or #pictureoftheday is far more insidious than when those hashtags go with blueberry pancakes. Rather than a mass attack on a hashtag to gain media attention or to intentionally disrupt the frivolities of the decadent West, these IS Instagrammers really do want likes for likes to construct a supportive community of like-minded individuals. These ‘instatags’ are not targeted or topical, yet they are arguably very invasive. 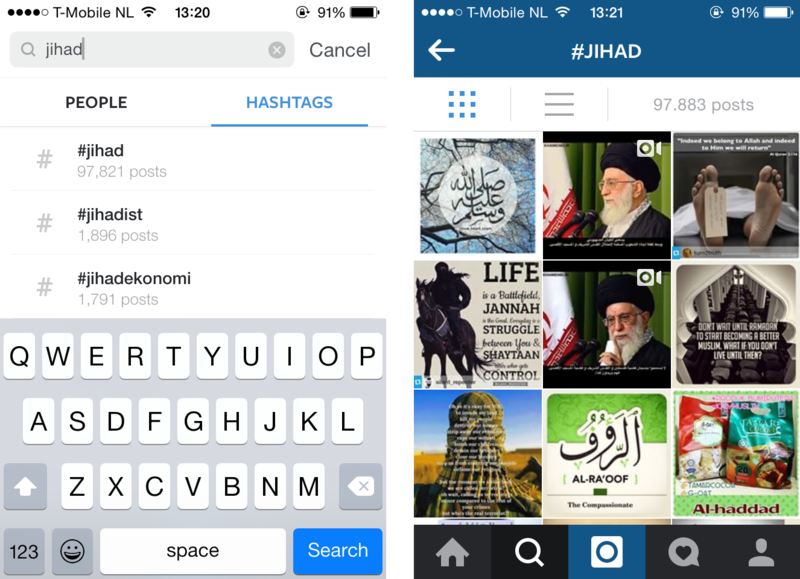 There are two broad groups of hashtags that blend extremist and non-extremist images on Instagram. Firstly, the stream of daily images and videos on Instagram is infiltrated by graphic IS content with the use of generic, secular hashtags like #funny, #peace and #likeforfollow. Secondly, more specifically, non-extremist Islamic content is latched onto by IS supporters using hashtags like #Muslimsbelike, #Quran, #AllahuAkbar and similar tags. For example, many images that are tagged with #Quran show inspirational passages from Islamic scripture. By tagging IS content with #Quran, Instagrammers reading through these quotes are exposed to IS’ barbaric nature and fundamentalist interpretation of Islam. These are not so much acts of strategic digital aggression as they are displays of ordinary behavior on Instagram. The seemingly untargeted use of these hashtags diffuses a message of extremism to an unsuspecting audience. Instagram offers a space for like-minded individuals to gather, but what control does it, as a company, exercise when communities become hotbeds for extremism? Popular users are aware of the value of their Instagram network of likes and followers. This popularity also puts the extremist accounts in danger: the more attention they get and the more value they amass, the more likely they are to have their accounts reported by other users and then deleted by Instagram. To counteract this, the more popular IS-supporting Instagrammers advertize back-up accounts in their profiles. By doing so, they prepare their followers for the next step should their account be deleted. As an additional layer of protection, extremist Instagrammers also tend to have private accounts, allowing them to judge whether the right kind of people are requesting access to their network. Besides relying on individuals reporting those profiles that they take issue with, the policing and blocking of undesirable and provocative content is a platform-controlled process that takes the form of interference with search results. For example, a search for #weed yields no results, while searching for #marijuana leads to an almost endless stream of images that are often also tagged with #weed, proving the existence of the hashtag on Instagram. However, no such measure seems to be in place for IS-related hashtags; a search for #khilafah takes the user directly to a pool of potentially extremist content. There is another, less crude way of interfering with search results that is best explained through the example of #thin. Searching for this hashtag does lead to the images tagged with it, but prior to being able to view them, the user is presented with a dialog box warning that images indexed under this term may be graphic, together with a link to more information about eating disorders. In the case of Islamic extremism and their use of politically and religiously charged terms, like #jihad or #mujahideen, outright blockage does not do justice to the diverse interpretations of these terms, and this method is not used on the platform. As broad concepts within Islam, they are not inherently violent but by being used together with brutal imagery the hashtags are repurposed in a violent way by some users. Because of this ambiguity of meaning the policing of content becomes a delicate issue, especially when this ambiguity is only apparent to those ‘in the know’. In fact, as well as being used as a method of censorship by the platform, hashtags are used by IS supporters as a strategy for counteracting censorship. Using an ambiguous hashtag, where the meaning of the term is not overtly extremist, is a convenient way to fly under the radar of Instagram’s censors. The hashtag #greenbirds, for example, seems harmless to most people, but alongside images of parakeets and support for the Philadelphia Eagles football team lie images of dead mujahideen and other references to jihadist martyrs. The ‘green bird’ metaphor is a gripping analogy that harks back to a book entitled In the Hearts of Green Birds: The Martyrs of Bosnia that eulogizes the martyrdom of foreign Islamic soldiers during the war in Bosnia. This is a poignant belief that the souls of fallen fighters are captured and carried in the hearts of green birds into paradise. The ambiguity that #greenbirds is charged with becomes even more explicit with the integration of emoji into Instagram’s captions, comments and even its search function. IS supporters’ use of emoji on Instagram is remarkable in its keeping with what has become conventional emoji usage. #Greenbirds is often accompanied by comments containing a green heart emoji, 💚. Hearts obviously mean different things in different contexts; but in the context of the Islamic State on Instagram, 💚 is a convenient portrayal of support and a further visual reference to the green bird analogy and love for martyrs. Another example is the pointed finger – or 👆– which is also used as a marker of alignment with IS’ fundamentalist interpretation of tawheed. By mirroring the one finger salute of IS fighters, 👆 is also distinct from the 💚 as it reflects a physical action, and as such can become an even more convenient shorthand for support. Ambiguity in meaning is precisely what makes the use of emoji such a convenient method for the pledging of support for IS without having to do so explicitly – potentially allowing users to fly under the radar and avoid censorship for as long as possible. 👆 and 💚 do not immediately evoke the idea of support for IS or martyrdom. For example, for those not in the know, 💚 could quite possibly evoke feelings of Irish pride or perhaps environmentalism. Sensitivity to the contextual meaning of these references is dependent on familiarity with actions and behavior that demonstrate backing for IS. The question remains as to how Instagram can provide a more nuanced approach to censorship, fighting the spread of extremism while keeping in line with the social connectivity that is its raison d’être. While the blanket ban on #edm was used to impede spam on the platform, this method does not translate to countering religious extremism and the posting of extremist content. Placing a moratorium on #jihad, for example, would alienate the far larger community of Muslims who use the hashtag in the context of their spiritual struggle in daily life as opposed to a militaristic struggle against non-believers. Facebook is a mobilizer. Twitter is an amplifier. Instagram is the romanticizer of causes, it is a voice for the idyllic. Be that as it may, perceiving Instagram as the whimsical younger sibling of Facebook and Twitter doesn’t negate its power as a tool for individuals intent on spreading terror. Unlike on Facebook or Twitter, everything about Instagram imbues content with a dreamy air, lending an ethereal quality to even the most graphic of images. With the use of in-app filters and external editing software, users call on globally familiar designs, aesthetic trends and humor to increase their images’ potential popularity and circulation. Like non-extreme Instagrammers, IS sympathizers promote both their cause and themselves, revelling in the acquisition of likes and followers. For while this is a community of IS supporters, it is also a collection of individuals wishing to promote both themselves and their content. It is nevertheless the homogeneity of each individual’s content in comparison with one another that shapes this community, a reflection both of the functionality and aesthetic of Instagram, and the single-mindedness of the Islamic State. With a hotchpotch of a professional and educational background in teaching, project implementation and international development, over the past few years Rebecca Cachia has found herself deep in new media. She is a bit of word nerd and an issues-oriented and analytical individual, fully realising the extent of which during her MA in New Media and Digital Culture at the University of Amsterdam. At present, Rebecca can be found pacing the corridors of the Cambridge University Press where she works in digital publishing. Rose Rowson is a London based writer and artist. Her academic research is primarily concerned with embodiments of the horrific in different media objects and movements. She has recently presented papers at Dulwich Picture Gallery as part of the annual worldwide Art+Feminism Wikipedia Edit-a-Thon, and at the Mechademia Conference on Asian Popular Cultures in Tokyo. Rose also is a founding member of expanded-form magazine and artist conglomerate Da Thirst. After studying Graphic Design and Film Studies, Inte Gloerich and acquired an MA in New Media and Digital Culture at the University of Amsterdam. Interested in the political and societal implications of digital phenomena, she focussed on the construction of political issues on Twitter during election time. Currently, Inte is a researcher at the PublishingLab at the Amsterdam University of Applied Sciences where she works on topics like open research publishing, hybrid publishing and online art criticism. Susan Clandillon works in communications for a European social policy network in Brighton, UK. She is interested in data journalism, graphic design, blogging and social media analytics. Susan completed MA in New Media and Digital Culture at the University of Amsterdam with Rebecca, Cristel, Inte and Rose and focussed on European separatist movements online for her thesis. After earning a BA in New Media and Digital Culture at the University of Amsterdam, Cristel Kolopaking proceeded into the consecutive Research Master, for which she is currently writing her thesis on the epistemological affordances of databases within Digital Humanities methodology. Her research interest lies in the cultural exchange between the offline and the online, as analysed through philosophical theories and supported by data-driven methods. Jessica Stern and J.M. Berger, Isis: The State of Terror, New York: Ecco, an imprint of HarperCollins, 2015. Michael Weiss and Hassan Hassan, ISIS: Inside the Army of Terror, New York: Regan Arts, 2015.